Fine Arts Quartet's Sunday concert features works by Schubert and Ravel they've previously recorded. The Fine Arts Quartet continues their Milwaukee concert series at 3:00 p.m., Sunday November 8 at the UW-Milwaukee Zelazo Center. 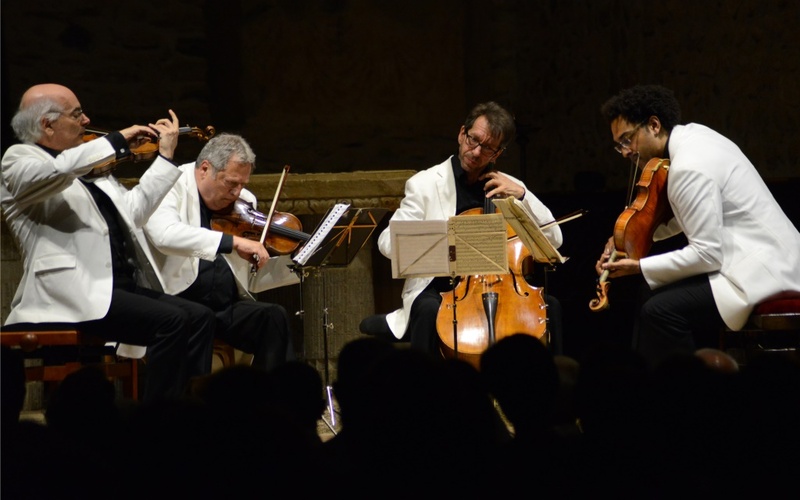 The quartet (violinists Ralph Evans and Efim Boico, cellist Robert Cohen and violist Juan-Miguel Hernandez) will return to the basic repertoire they do so well – classical music masterpieces for quartet alone. Both Franz Schubert‘s “Death and the Maiden” String Quartet and Maurice Ravel‘s String Quartet are clearly standards. In the long distinguished history of the Fine Arts Quartet, each have been issued as recordings three times – from as long ago as 1946. The latest CD performances of each were published in 1986. Although only half of today’s quartet participated, the FAQ’s signature sound has remained consistent since then. Schubert enjoyed a successful life as a popular writer of songs early in his career. He wrote over 600 lieder. In what might have been his mid-career, he turned his attention to chamber music and symphonic works. But tragically, he died at 31; leaving us to speculate about what other works he might have contributed. 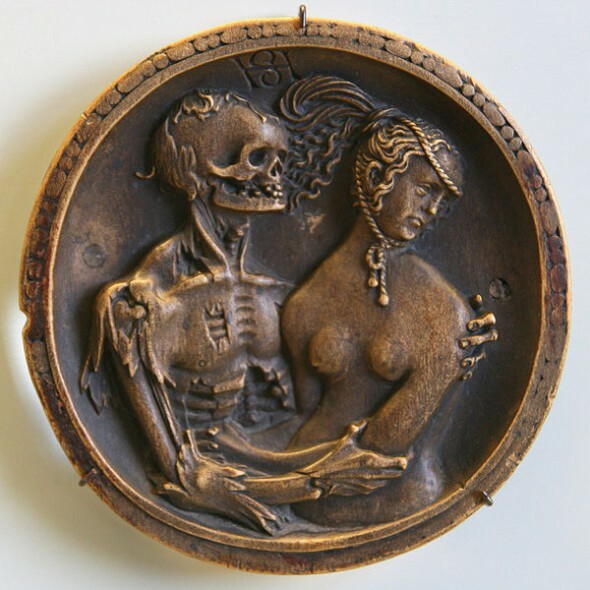 Death and the Maiden. Woodcut by Hans Schwarz. Within mine arms shalt softly rest thee! The quartet might be viewed as program music. A violent first movement appears to reflect the maiden’s horror and eventual resignation. The hauntingly beautiful slow movement variations are constructed from the melody for Death in Schubert’s song. A hectic scherzo is followed by a finale as a tarantella. Music critic Walter Willson Cobbett concludes, “The finale is most definitely in the character of a dance of death; ghastly visions whirl past in the inexorable uniform rhythm of the tarantella.” Or the pace of the finale could be heard as the gallop of a horse trying to escape as a father tries to shield his son from death as dramatized in another Schubert song, the Erlkönig. Cellist Cohen has insisted that the Fine Arts Quartet is not motivated by possible story lines: “People writing about music have to find a way of putting it into words. Musicians use their musical instincts. We have to express whatever is written.” For the FAQ, nothing extra-musical seems to be allowed to interfere with Schubert’s use of two themes from the song as the basis for an abstract formal composition – although a melancholic one. A sonata form first movement follows a traditional development structure, although adding clarity by use of simple harmonies such as sections where first violin and viola play two octaves apart. That is followed by a bright scherzo with pizzicato color and mixed time signatures that suggests a Javanese gamelan orchestra. The slow movement recalls earlier themes within a improvisational atmosphere, revealing Ravel’s skill at finding unexpected colors in his compositions. The rondo finale opens with stormy passages, shimmering strings and brief moments of calm, recalling other sections. The quartet ends on a dramatic note. The November 8 concert begins at 3:00 p.m. and will be preceded by a pretalk at 2:00 p.m. Tickets may be purchased on-line at the Peck School of the Arts box office or at (414) 229-4308. Tickets are a bargain $10 ($5 students). The Zelazo Center is located at 2419 E. Kenwood Blvd. Parking is available in the Zelazo Center lot, to the south of the building, and in the Union parking garage across Kenwood Boulevard. Parking is free on Sundays only. The Fine Arts Quartet will offer their third concert in the series January 31, 2016. They have selected less performed works by Beethoven, Felice Giardini and Louis Théodore Gouvy. Cellist Niklas Schmidt will join the quartet for the String Quintet in G by Gouvy.